A 60-year-old man was found to have an incidental pancreatic cystic lesion during surveillance magnetic resonance imaging (MRI) for a known left renal lesion. Endoscopic ultrasound (EUS) revealed a cystic lesion (2.6 × 2.0 cm) with a single thick septum in the pancreatic tail ([Video 1]). Needle-based confocal laser endomicroscopy (nCLE) of this lesion was performed with an AQ-Flex-19 miniprobe (Cellvizio; Mauna Kea Technologies Inc., Paris, France). This demonstrated nests of cells surrounded by fibrous septa and vascularity, suggestive of a cystic pancreatic neuroendocrine tumor (PNET) ([Fig. 1]). 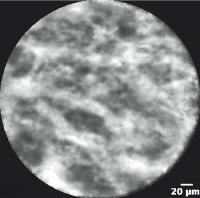 A pattern of vacuolization was also observed ([Fig. 2 a]; [Video 1]). Fine needle aspiration (FNA) with immunostaining of the sample obtained confirmed the diagnosis of a well-differentiated PNET. Fig. 1 Endoscopic ultrasound with needle-based confocal laser endomicroscopy of a pancreatic cystic lesion demonstrating dark clusters of cells with surrounding gray stroma (trabeculae). Fig. 2 The pancreatic cystic lesion seen on: a endoscopic ultrasound needle-based confocal laser endomicroscopy showing a unique pattern of vacuolization intermixed with dark nests of cells; b hematoxylin and eosin staining of the resected specimen (magnification × 400) showing intracytoplasmic globules (arrows) within the cords of tumor cells. Salt-and-pepper type chromatin, characteristic of neuroendocrine neoplasms is also seen. Video 1 Computed tomography, magnetic resonance, and endoscopic ultrasound imaging of a pancreatic tail lesion. 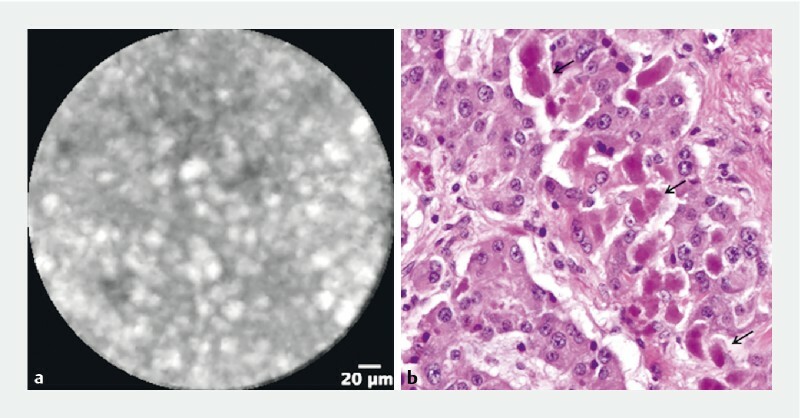 Needle-based confocal laser endomicroscopy shows the established pattern of a neuroendocrine tumor with an additional novel pattern that corresponds to the histopathological appearance of the resected specimen. The patient underwent distal pancreatectomy and splenectomy. Histopathology of the surgical specimen showed a well-circumscribed mixed solid–cystic lesion ([Fig. 3 a]); synaptophysin immunostaining was reactive and chromatin demonstrated a salt-and-pepper pattern, consistent with a well-differentiated PNET ([Fig. 3 b]). Additionally, the tumor cells contained hyaline globules of varying sizes within the cytoplasm ([Fig. 2 b]). This finding correlated with the vacuolization image pattern seen on nCLE. The presence of these globules has been described in PNETs and solid pseudopapillary tumors, with the descriptive appearance of cytoplasmic vacuolization  . A similar pattern has been attributed to the presence of cytoplasmic lipid, which is more common in cystic NETs . Fig. 3 Appearance of the resected specimen: a on gross examination, showing a pancreatic tail mass consisting of collapsed cystic areas (asterisks) not in communication with the pancreatic duct (arrow); b on immunostaining with synaptophysin, showing diffuse reactivity of the tumor cells, supporting the diagnosis of a well-differentiated neuroendocrine tumor. Chromogranin was also reactive (not shown); Ki67 was 3 % and zero mitoses were seen per 10 high-power fields, in keeping with a WHO grade 2 neuroendocrine tumor. Napoleon et al. first described the nCLE criteria of cystic PNETs, which have been validated in resected ex vivo lesions and by independent external observers . The EUS-nCLE findings so far described in cystic PNETs include a trabecular network of dark cells with surrounding fibrosis and vascularity  . This case presents a unique recurring feature of vacuolization that correlated with a comparable histopathological pattern. This spectrum of nCLE image patterns for cystic NETs can further assist in the differentiation of pancreatic cystic lesions.